Day 96: Running all over the town of Mt. Shasta! With the mosquitoes attacking and town only a few miles away, there was no incentive to waste time eating any kind of lengthy breakfast. Instead, I ate a Snickers bar and a packet of almond butter. I had gotten up fairly early, but some other hikers, including the two brothers, had gotten up even earlier and were singing their way down the trail. They paused to wave to me in my campsite as they passed by. I was quite proud to have started walking by 7:22! I was still unsure how I was going to get into Mt. Shasta. I had heard rumors about there being a bus stop at the next exit up the Interstate, but I didn’t know what times it would stop there. Although I only had to walk two and a half miles, it still took more time and energy than I had hoped. 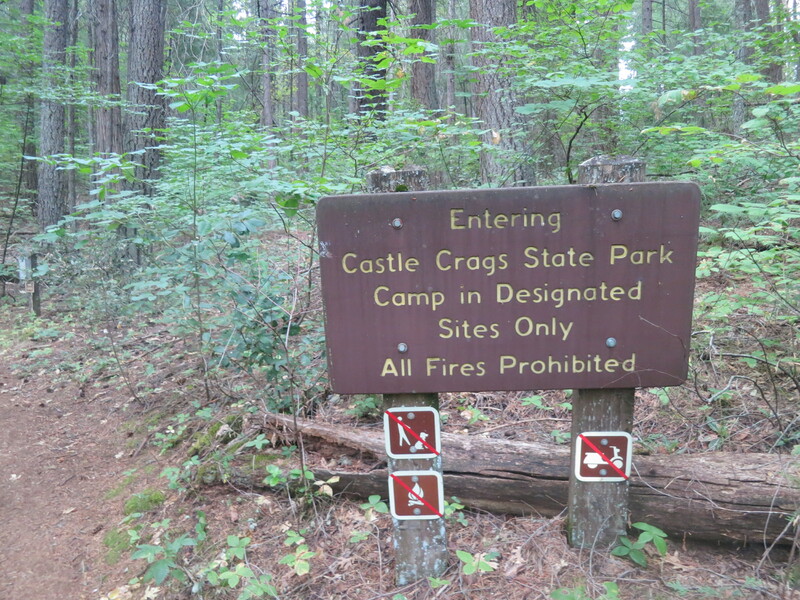 As I neared the road, I was surprised to see a sign announcing the beginning of the Castle Crags Wilderness. I would have expected that sign to be on the other side of the highway! I came out onto a small road and walked along it until I reached the Sacramento river, still unsure of where I was going or what I was doing. A car approached from behind me, slowed down, and then stopped. I looked back and saw the driver waving me over. “Do you need a ride?”. I told her I needed to get to Mt. Shasta and she said that she was headed that way! I couldn’t believe it! I didn’t even have to stick out my thumb! What could have taken several hours ended up costing me no time at all and it was all due to timing! I put my pack in the backseat and joined her up front. She turned onto the highway and then I saw another female backpacker hitching with a sign to Mt. Shasta. We pulled over to collect the hiker who I learned was Cookie. Our driver worked at a veterinary clinic and took care of horses at her home. She once cared for a man who had tried hiking the PCT with three horses. One of them got so scared crossing Hat Creek Rim that it tumbled over the edge to its death. We had a nice view of Mt. Shasta in front of us and she asked if we could see the face of the Princess in the snow. I tried as best I could, but never really saw it. Since our driver was late for work, she dropped us off at the intersection leading into town, highly encouraging us to visit the Organic Store. “What?? That’s the first I’ve heard of that!!”. He said he thought I had quit back in Mammoth because my Achilles was hurt. I told him my stomach has been much worse of a problem, but there is no part of me that is a quitter! Later, the other hiker who had been listening asked, “You were going to quit?”. I set my pack in my room and headed out to the post office to pick up my resupply box. Then, I carried it back to my room and headed out to two outfitters to look for shoes, and possibly a purple shirt, as the one I had ordered before the trail was in the box that had gotten lost by the post office. I didn’t find a shirt, but I did find my shoes and pair of sunglasses to replace my broken ones. Then, I headed to the drugstore to look for a new pair of headphones. I found a set of three for $10, but had to wait an excruciatingly long time for an employee to unlock them for me. (They were really that worried about a $10 item being stolen??). 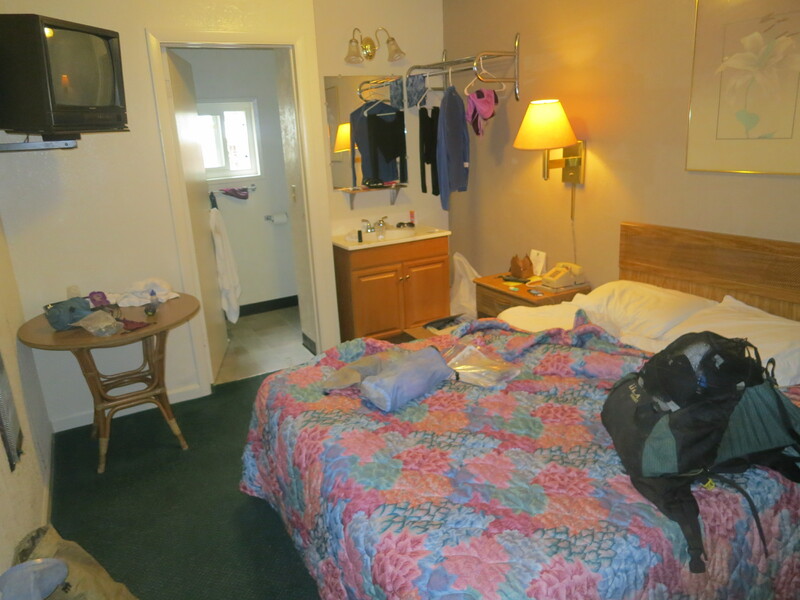 Then, I walked back to my room, where I finally got to take a shower and start pre-rinsing my filthy clothes. Next, I headed down to the laundromat and then had to sort through my supplies and make up a box to send ahead, with my new shoes. Then, it was back to the post office to send it out! Town days are even more exhausting than hiking 28 miles per day! There is too much to do in too little time and our energy is spread all over the place! In addition, the attitudes of a lot of these townspeople bring my energy down! Life on the trail is so much more simple! When I returned to the motel, I found Shyshinka sitting outside. I had last seen him when I was heading down into Yosemite Valley and told him about not being able to find the Cloud’s Rest Trail and my adventure climbing Half-Dome. He asked me if it was really crowded on the way into the Valley, as it had been for him. He said that he hates crowds and was wishing to be alone, but a day or two later, ended up getting caught in the storm, his maps got wet, and he got lost. Then, all he he wished for was another person to appear! Being alone made him even more scared. He set up his tent that night, not knowing where the PCT was. Somehow, the next morning, he was able to find it. He told me that he didn’t know who had helped him, but that he appreciated whoever it was. I nodded, understanding exactly what he was talking about. I told him that, often, we just need to get quiet and not panic, and know that we are being guided by something or someone and that we will find our way out. He told me that he went to his first ever yoga class this morning with Lotus and I told him that I was interested in hearing what his experience was like! He was waiting to go to dinner with Beer and Ranch and invited me, as well, but I needed to attend to my laundry, and decided that I wasn’t all that hungry, anyway. I just picked up a few snacks from the organic grocery store to eat in my room. I tried to attend to a few chores, but grew so tired, that I had to just lie down and go to sleep! This entry was posted in Uncategorized and tagged Mt. Shasta, Pacific Crest Trail, PCT 2013 blog, PCT thru-hike by Wendy. Bookmark the permalink.